Opossums refer to a group of marsupials that have notably sharp snouts and broad appetites. Roughly 60 species of these mostly nocturnal creatures exist. Virginia opossums (Didelphia virginiana) are the sole marsupials that roam freely throughout Canada and the United States. As with the rest of the members of the animal kingdom, water intake is a must for opossums. Opossums drink water in a manner not too different from that of many other animals -- by lapping it up from available water sources. Some possums retrieve their water out of openings in trees. Others get their water by drinking groundwater seepage that collects in woodsy areas. Some opossums, like water possums (Chironectes minimus) frequently live in watery environments where access to H20 is plentiful, often lakes or creeks. Opossums in general frequently gravitate to forested areas that are close to reliable water access. Water is indeed a necessity for opossum life, and while many of them do live close to it, it isn't unheard of for them to reside relatively far away from it, too. Some opossums can even manage for months at a time without dependable water access. This could be a result of their diets providing them with the necessary hydration, however, whether via green foliage or insects. Certain components might also decrease the water demands of some opossums, including nocturnal lifestyles and often damp settings. Water is beneficial for opossums in that they need to drink it to survive. However, they also simply enjoy swimming in general. Not only do they enjoy swimming, they're extremely proficient at it, too. Opossums that live close to human beings also frequently satisfy their water needs by drinking out of water dishes that are left outside for pets. Outdoor water dishes are actually a big draw for these omnivores, along with pet food and trash that isn't carefully closed off. 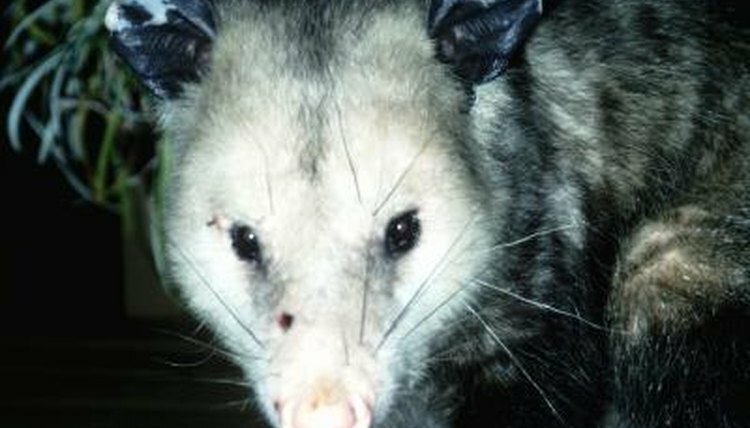 Pet food is a common meal for opossums that live in city and suburban settings. While opossums are indeed prevalent in these kinds of human-packed areas, sightings of them are somewhat few and far between since they're mostly active in the nighttime. Water is a major component of what opossums need to stay healthy and strong, but it's far from the only thing they need. The sturdy creatures readily consume varied diets that are made up of elements such as tiny rodents, snakes, frogs, birds, vegetables, nuts, grass, decaying animal carcasses and chickens.